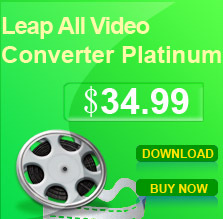 Leap AVI FLV MPEG WMV ASF MP4 to iPod Converter converts your videos quickly and easily into the format that your iPod can play. 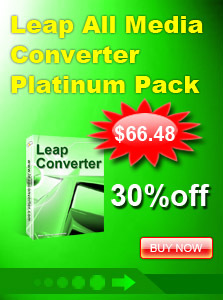 You can convert almost all video formats, e.g. AVI, WMV, MPEG, MP4, ASF, VOB, 3GP, iPhone, MOV, FLV to iPod video formats. With Leap AVI FLV MPEG WMV ASF MP4 to iPod Converter you can put your favorite videos on your iPod player and watch them wherever and whenever you want. Let the kids watch their favorite cartoons in the car with the iPod player. Run on Windows /98 /ME/NT/2000/XP/2003 Server/Vista. Copyright ©2008-2009 www.leapconverter.com All Rights Reserved.